After 30 Years In Syria, Outspoken Priest Is Expelled When anti-government demonstrations began last year, the Rev. Paolo Dall'Oglio supported the young Syrians calling for democracy. During his three decades in Syria, the Italian Jesuit priest helped restore an ancient monastery outside of Damascus and promoted Christian-Muslim dialogue. Syria has expelled an Italian Jesuit priest for his outspoken criticism of the government's crackdown on a popular uprising. The Rev. 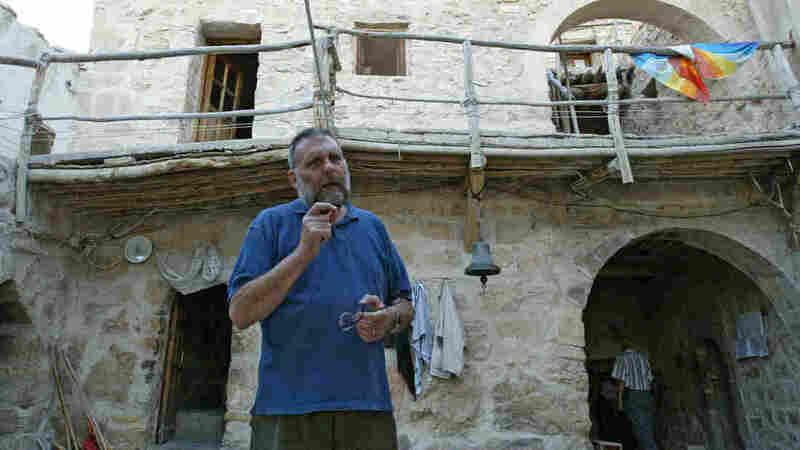 Paolo Dall'Oglio has lived in Syria for 30 years, helping to restore a 1,000-year-old monastery that became a center for Muslim and Christian understanding. Dall'Oglio's departure from Damascus on Saturday was sudden. More than a year ago, the government ordered him out, but a campaign on Facebook — "No to the Exile of Father Paolo" — delayed his expulsion. When the anti-government demonstrations began last year, Dall'Oglio supported the young Syrians who risked their lives to protest peacefully. "I am very moved by the face of many youth that have been suffering enormously to achieve their desire of freedom and dignity," Dall'Oglio said last week from the garden of his home in Damascus as he bade farewell to friends and supporters before his expulsion. "There are so many young persons that are put in jail and tortured, just because they have expressed, nonviolently, their opinions." His opinions have finally landed him on the wrong side of the government. For three decades, he headed a Christian community in an ancient monastery he helped restore in the hills outside Damascus. He invited Muslims and Christians to pray together — and they did — in more peaceful times. But Dall'Oglio says the uprising has strained Syria's diverse religious fabric. The government says it protects religious minorities — the Christians, the Alawites and others — against what it says is an uprising of Muslim fundamentalists. Dall'Oglio rejects this picture as simplistic, but acknowledges the tensions. When asked whether he thinks Christians in Syria are under threat from the uprising, Dall'Oglio is adamant that it is not the revolution that threatens them, but the conflict between the opposition and the regime, and the Alawite community. "So there is, in some parts of Syria, in a real civil war — we know that," he said. Dall'Oglio also knows Syria's minority Christians have real fears, but he says it is a generational issue. Older Christians have no experience with democracy — not in the family or in the community. Many younger Christians have joined the revolt because, he says, they believe democracy is better protection than the regime's violence and oppression against the Muslim majority. "Many Christian youth believe in a better world. We should pay attention to them. Something new has happened," Dall'Oglio said. "I've been with Alawites for democracy, Sunnis for democracy, Christians for democracy — these people are real." They are real, he says, and in danger. When a young activist, photographer Basil Shehadi, a Christian, was killed by a sniper in the embattled city of Homs, the church in Damascus refused to hold his funeral — a sign of the divisions in the community. Dall'Oglio arranged to hold the service at his monastery, where he says young activists — Christians, Sunnis and Alawites — mourned the loss and prayed together. Does he have faith in this uprising now that it has entered a more violent phase? "I am a monk, and I have taken a position with nonviolence," he says. But, he adds, "the church I belong to believes in the right of people of self-defense. I will stay faithful to nonviolence, but I won't be astonished that violence brings violence in reaction." Dall'Oglio's departure comes as the Syrian government has launched a relentless offensive against the armed wing of the revolution. Civilians, no matter their religion, are dying every day. The priest's supporters say the government is trying to silence a voice for religious tolerance, just as the country slides into civil war. "It would be better for me to be dead with the martyrs of this country than to go away in exile," Dall'Oglio says. "I have offered my life for the future of this country, and I wish to stay in full solidarity with them; so I will come back." But not, he fears, anytime soon.